Epimedium is a genus of about 60 or more species of herbaceous flowering plants in the family Berberidaceae. The large majority are endemic to southern China, with further outposts in Europe, and central, southern and eastern Asia. 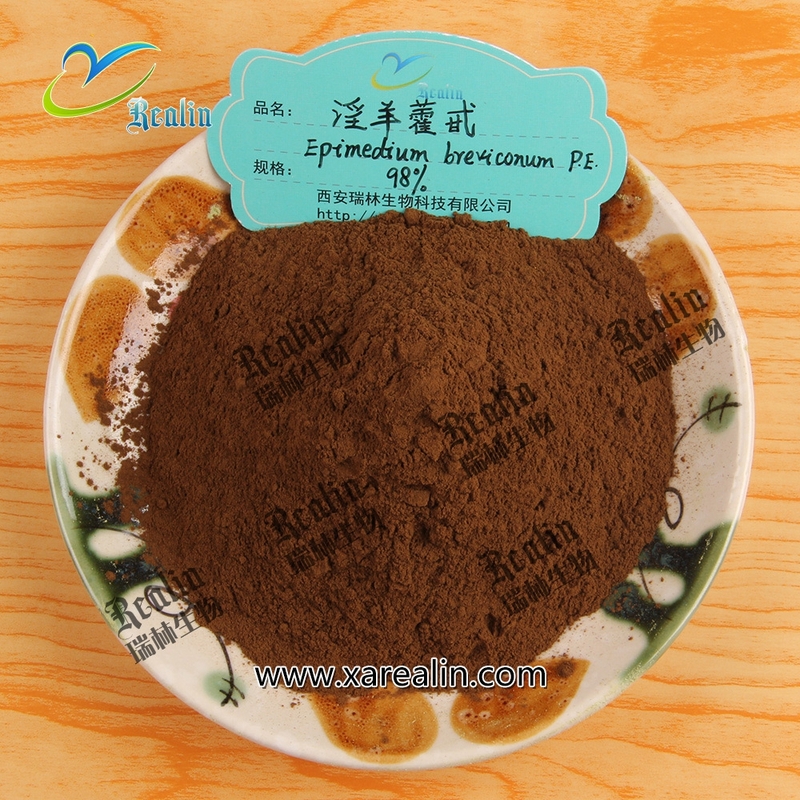 Usually make the Epimedium brevicornum and epimedium sagittatum as the raw material because of their high quality. Epimedium offers effective support in conditions that result from kidney yang deficiency, such as impotence and chronic prostatitis in males, and irregular menses, infertility and menopause in females. Epimedium's glycosides help to tonify and regulate both androgenic and estrogenic reproductive functions. have aphrodisiac properties in males, increasing the production of sperm, stimulating the sensing nerves, and indirectly promoting sexual desire. Epimedium is ideal for adding to sexual enhancement formulas. (1)Enchance sexual functions traditionally, and research that icariin can enchance erectile functions. (2)Benefit kidneys and remove rheumatisms. (4)Prevent menopause and high blood pressure. (6)Increase coronal pulse flowing, and accelerate spermatic fluid. (2) Applied in the field of health care products, it was used in capsules, health food, oral liquid, health care wine and other alcoholic beverages, which has good healthcare effect on human cardiovascular and endocrine system, delaying aging. Icariin is a chemical compound classified as a flavonol glycoside, a type of flavonoid. It is the 8-prenyl derivative of kaempferol 3,7-O-diglucoside. The compound has been isolated from several species of plants belonging to the genus Epimedium which are commonly known as Horny Goat Weed or Yin Yang Huo. Extracts from these plants are reputed to produce aphrodisiac effects, and are used to enhance erectile function.